Barnsley’s May Day Green Market has opened for business marking completion of the first major milestone in the £100 million town centre redevelopment. The new temporary market hall is a vast improvement on the old semi-open market. The building is light and airy, with the anchor of a quality café provision at the front entrance and customer toilet provision at the rear of the building, encouraging customers to track through the market isles. The 84 large well designed stalls with specialist display boards and well positioned electrical sockets, plus free Wi-Fi, provide much better facilities for traders and a better experience for customers. Bright colourful branded graphics highlight not only the new May Day Green Market and its traders but traders and produce from the main Market Halls, Meat and Fish and Cafes. 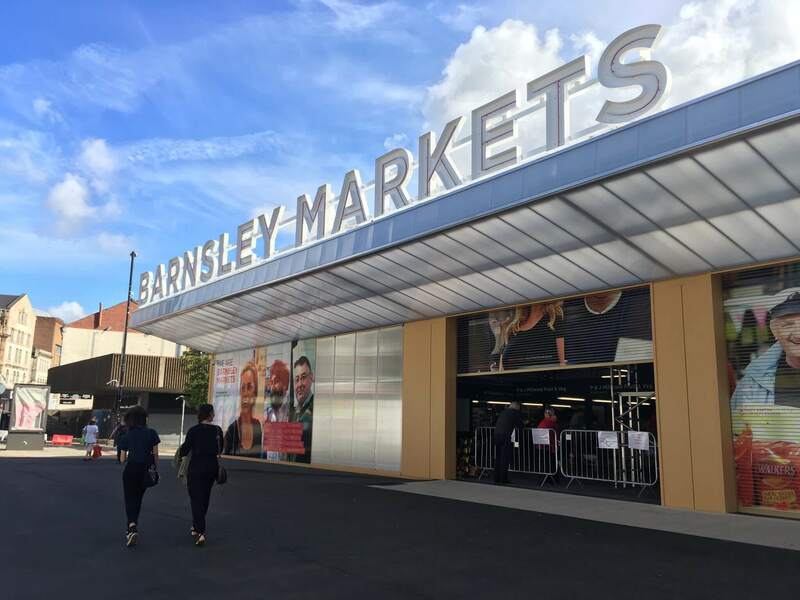 These graphics will be replicated as new entrances to the main Market Halls to ensure customers recognise the Barnsley Market brand across all sites, encouraging footfall to over 200 stalls throughout the May Day Green, precinct and main market halls. Over 40 traders have moved into the new temporary market, which will allow work to begin on the next phase of the Better Barnsley project. Further demolition and the refurbishment of the Metropolitan Centre which houses the indoor, meat and fish markets will commence early 2017. The Metropolitan Centre will remain open for business whilst the renovations are ongoing. The semi-open market traders are excited about trading in the May Day Green Market Hall. The Better Barnsley project started with the demolition of the 1970’s former council offices, undertaken by Sheffield based demolition firm Hague. Following the demolition, Hague employed Billington Structures, a local Barnsley firm to design and build a steel podium on the site that attached to the existing concrete columns, to create a level structure for the new May Day Green Market to be built on. Temporary building specialists, De Boer Structures, then took over the site to create an impressive 2,558 sq. m steel structure that would provide a temporary three-year home for the semi-open market traders. Henry Boot Construction Limited, the main contractor for the Better Barnsley project completed the interior fit out, the external works and will provide a permanent presence in Barnsley throughout the scheme which includes the construction of retail, leisure and market space, including areas for food and drink a new library and new landscaped public open space (the Market Square), following the demolition of existing buildings.